Cyclohexasiloxane, Dimethicone, Dimethicone Vinyl Dimethicone Crosspolymer, Silica, Acrylates Crosspolymer, Disodium Stearoyl Glutamate, Aluminum Hydroxide. Keep my makeup on longer for sure but definitely also breaks me out badly. Not good for oily skin Make you break out I bought this after reading good reviews. I have acne prone and oily skin. This made me break out and my makeup did not glide smoothly over it. Made my face more oily and It was expensive so it was kind of a bummer. affordable nice smell face was softer after a few uses glided on face well- didn't leave white marks didn't notice much of a difference after applying my makeup didn't last all day L'Oreal studoo secrets perfecting base was a good product when initially putting it on before applying makeup but halfway thorough the day my makeup did not stay on at all. 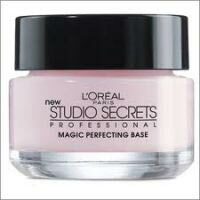 This product did not prolong the life of my makeup application or make my skin feel/look rejuvenated. -Very Soft -Alittle goes a long way -Works with any Foundation -Does not cover over rough patches -Effects fade over a long day -Falls into wrinkles and makes them appear more Its an amazingly soft primer but that's about the main gist of it for me. Ãt didn't smooth over rough skin, wrinkles, acne scarring, or blemishes. As the day wore on the primer would make my makeup seep even more into my lines and it just did not live up to its reputation for me. I have very oily skin with lots of dry patches and bad acne. If your skin is different (clearer, better complexion) this might work for you. Goes on so smooth Feels very light on my skin Fills in pores and any fine lines making them less noticable. Basically does what it says it will. None yet. As of right now I plan to be a repeat customer and am even considering buying the magic smooth souffle fondation to go with.